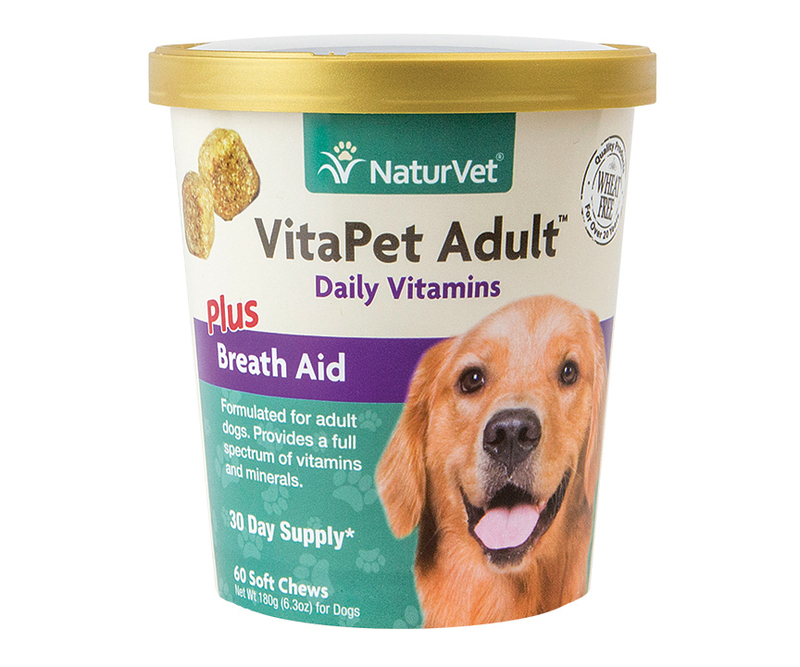 Formulated specifically for adult dogs over 1 year. Provides a full spectrum of vitamins and minerals with omega 6 fatty acids. Glycerine, Dicalcium Phosphate, Brewer’s Dried Yeast, Dried Potato Product, Flaxseed, Lecithin, Canola Oil, Parsley Leaf, Natural Flavoring, Water, Magnesium Stearate, Maltodextrins, Tapioca Starch, Ferrous Sulfate, Niacin Supplement, Sorbic Acid (a preservative), Mixed Tocopherols (a preservative), Rosemary Extract, Vegetable Oil, Beta Carotene, Vitamin A Palmitate, Zinc Sulfate, Vitamin E Supplement, dl-Methionine, Riboflavin, Thiamine Mononitrate, Vitamin D3 Supplement, Manganese Sulfate, Pyridoxine Hydrochloride, Copper Carbonate, Potassium Iodide, Cobalt Carbonate, Vitamin B12 Supplement.